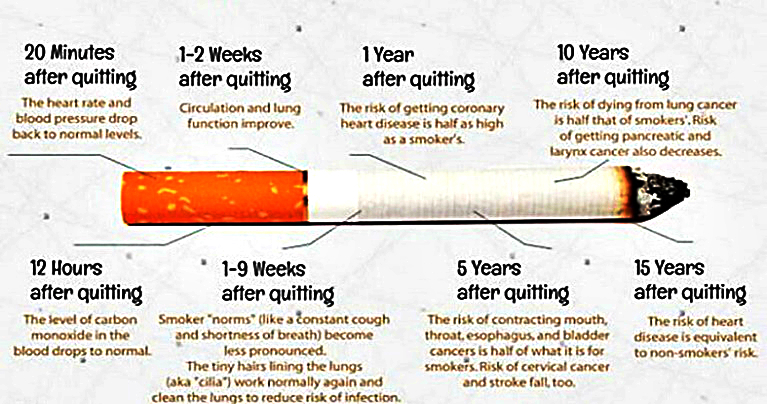 You know smoking isn’t healthy, but do you know what happens to your body when you quit? It gets better from top to bottom, lungs to legs. Learn how in the slideshow below, featuring information from Cleveland Clinic’s Tobacco Treatment Center. 20 minutes after your last smoke, your blood pressure and pulse drop to normal. After 8 hours, the level of carbon monoxide in your blood drops to normal, and the oxygen level rises to normal. After 24 hours, your chances of a heart attack decrease. At the 48-hour mark, your senses of smell and taste are enhanced, and your nerve endings start regrowing. Between 2 weeks and 3 months, walking becomes easier, your circulation improves and your lung function increases up to 30 percent. At 1 to 9 months, your body’s overall energy increases. Coughing, sinus congestion and shortness of breath decrease. Cilia regrow in the lungs to help clean them and reduce the chance of infections. At 1 year, your excess risk of coronary heart disease is half that of a smoker’s. After 5 years, your risk of mouth, throat and esophageal cancer is half that of a smoker’s. Stroke risk is the same as a nonsmoker’s, and the lung cancer death rate is almost half that of average smokers (one pack a day). After 10 years, the lung cancer death rate is comparable to a nonsmoker’s. Precancerous cells are replaced, and the risk of mouth, throat, esophageal, bladder, kidney and pancreatic cancer decreases. Congratulations. 15 years after quitting, your risk of heart disease is the same as a nonsmoker’s.